Advanced Dungeons and Parenting: Tor Brings You Zombies for Christmas. Who'da Thunk? Tor Brings You Zombies for Christmas. Who'da Thunk? Many people think that Christmas ends on Christmas day. They spend the weekend, or the day, after Christmas taking down their decorations and tree. In doing so, they are ending the celebration mid-event. As is hinted at in the perennial Christmas carol about a certain partridge in a pair tree, there are 12 days of Christmas. Traditions vary as to whether Christmas morning is when one begins counting the days, or Christmas evening. One thing is certain, Christmas ends on January 6th with the celebration of Epiphany -- or 12th night for Shakespeare fans -- or Christmas for Orthodox Christians. 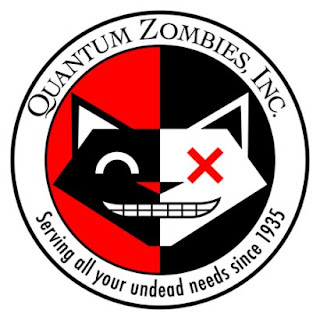 Tor books, the people who brought us Better Zombies through Physics, is offering us a Zombie treat for each of the 12 days of Christmas. 12 days of brain eating horror. Seems a pretty good Christmas gift if you ask me. If only they began the festivities on December 25th instead of December 22. But maybe Zombie Christmas is on the 22nd of December and Orthodox Zombie Christmas is on January 2nd.